This month, Tried and Tasted features Raaga, one of my favorite bloggers. With a freewheeling style pretty much like mine, Raaga blogs about whatever she fancies, be it an Indian curry, a casserole or a cake. Since the event requires that you create a recipe of your choice out of the month's chosen blog, I had a great time going through Raaga's archives and shortlisting some 5-6 recipes. Then I had my spectacular daring bakers disaster. I don't know what happened - no one else seemed to have any trouble with the recipe - but mine wasn't meant to be. So in need of comfort food, I turned to Raaga's mushroom and capsicum pizza. Raaga says this is the pizza they would eat before Pizza Hut and Dominos came to rule the world. The pizza your mom would make for dinner in fact, complete with an Indian style masala. 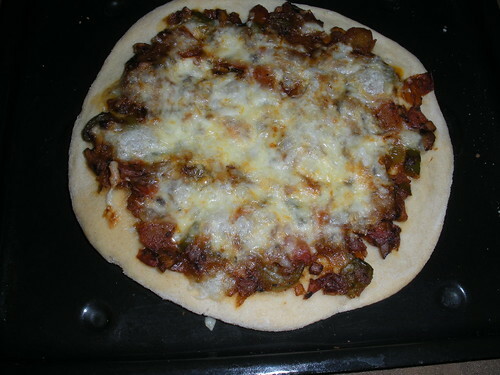 I made the yeasted base, then once it had risen, topped it with mushroom and capsicum "masala". A layer of grated mozarella on top, then baked at the highest my oven would go until browned. It might be just me and my penchant for tandoori pizzas, but I think this is the best pizza I've ever eaten. Mushroom and Capsicum pizza is also my entry for Global Kadai, hosted this month with the theme "Indian Flavored Pizzas". Yum yum! What I would for a slice of this!